A short series of cartoons depicting the authors sense of humour throughout the seasonal calendar. 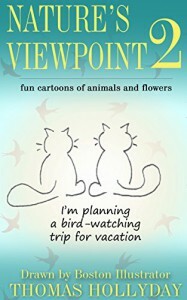 The drawings and witty reports that go alongside them will appeal to young and old, bringing a smile to your face and makes you look at the flora and fauna as well as the wildlife you see daily in a more enlighted way. The book also portrays an ecology side to it showing us that we need to protect and nurture nature in its surroundings for future generations to enjoy and to cut back on our waste products which we all can achieve. The simplicity of the sketches can be discussed in length to define their interpretation and each cartoon will conjure a different thought process to everyone who looks at them and could be used as an educational aid. The beauty of animation is the message they portray to everyone from the drawings by ancient caveman to the classic artists and finally to the modern day. I enjoyed these cartoons and have revisited them several times and each time I have noticed or thought something different which is authors intention.